*all sandwiches include kettle chips. black forest ham, swiss cheese, mayo, house mustard, lettuce, tomato, red onion & kosher pickle. salame, capicola, provolone, balsamic vinaigrette, lettuce, tomato, red onion & pepperoncini. 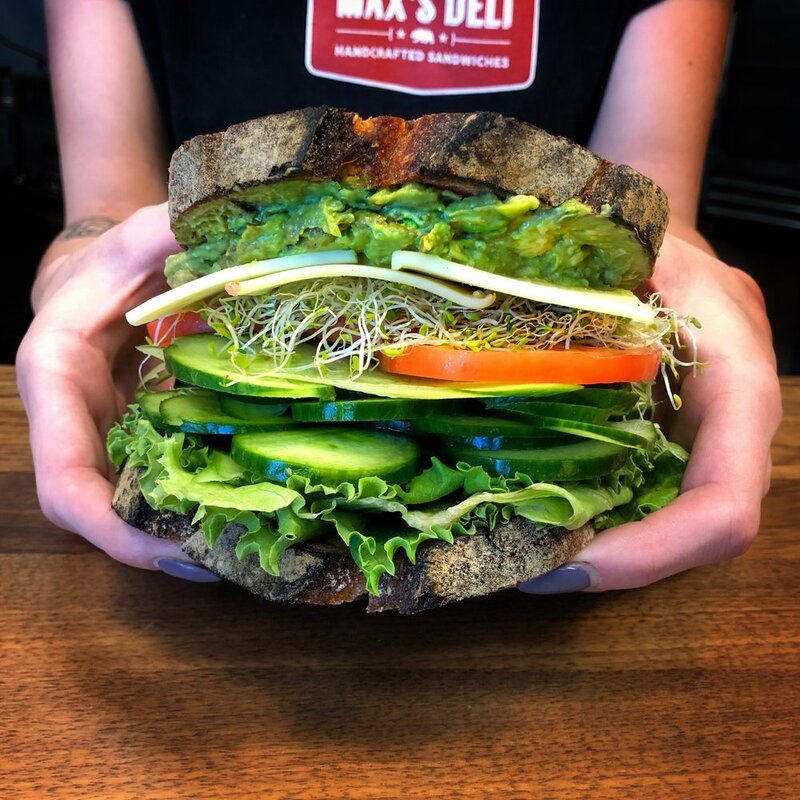 mayo, house mustard, lettuce, radish sprouts, tomato, red onion, cucumber, monterey jack cheese & hand-smashed avocado. 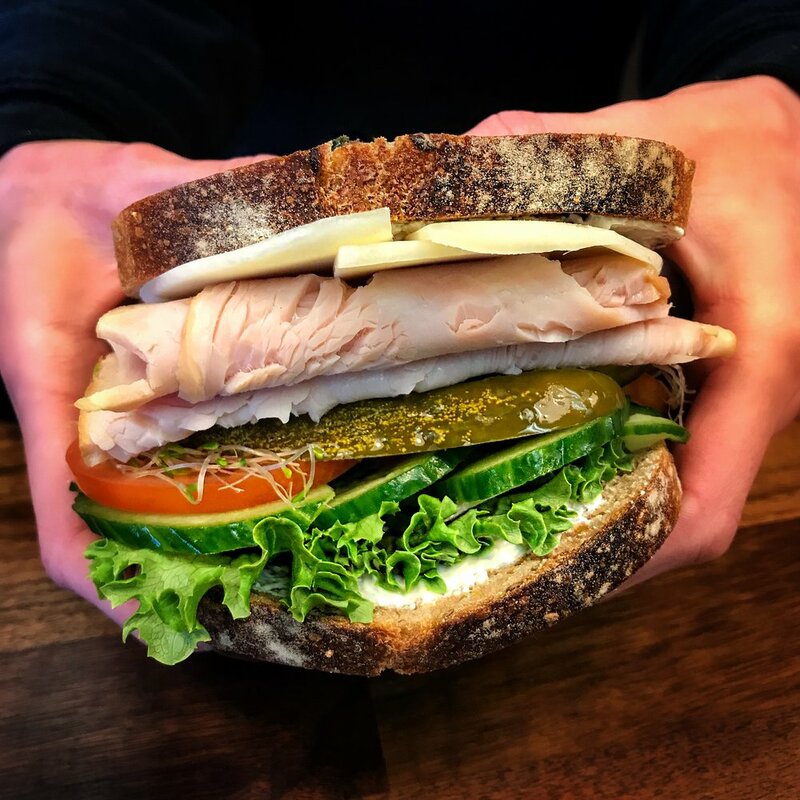 smoked turkey, hand-smashed avocado, pepper-jack cheese, mayo, house mustard, lettuce, tomato, red onion & kosher pickle. roast beef, sharp cheddar, mayo, house mustard, lettuce, tomato, red onion & kosher pickle. pesto chicken salad, mayo, mixed greens, tomato. light tuna salad, mayo, lettuce, red onion, kosher pickle. smoked turkey, cream cheese, seasonal greens, red onion and jalapeño-cilantro infused cranberry sauce. smoked turkey, cream cheese, seasonal greens, radish sprouts, red onion, raspberry-walnut drizzle & avocado. smoked turkey, mayo, pesto, seasonal greens, tomato, red onion & hand-smashed avocado. pastrami brisket, swiss cheese, house mustard & kosher pickle. pastrami brisket, swiss cheese, shredded red cabbage, baja aioli & kosher pickle. "grilled cheese" sharp cheddar & havarti cheeses on sourdough bread grilled on the panini grill. full sandwich only, six bucks. pastrami brisket on a white roll with mayo, red cabbage, matchstick carrots, fresh cilantro, peppers and a sweet & spicy hoisin sauce. Need more? These items may be added to your sandwich for an additional charge. *All dressings are [GF] gluten free with the exception of Thai Peanut. 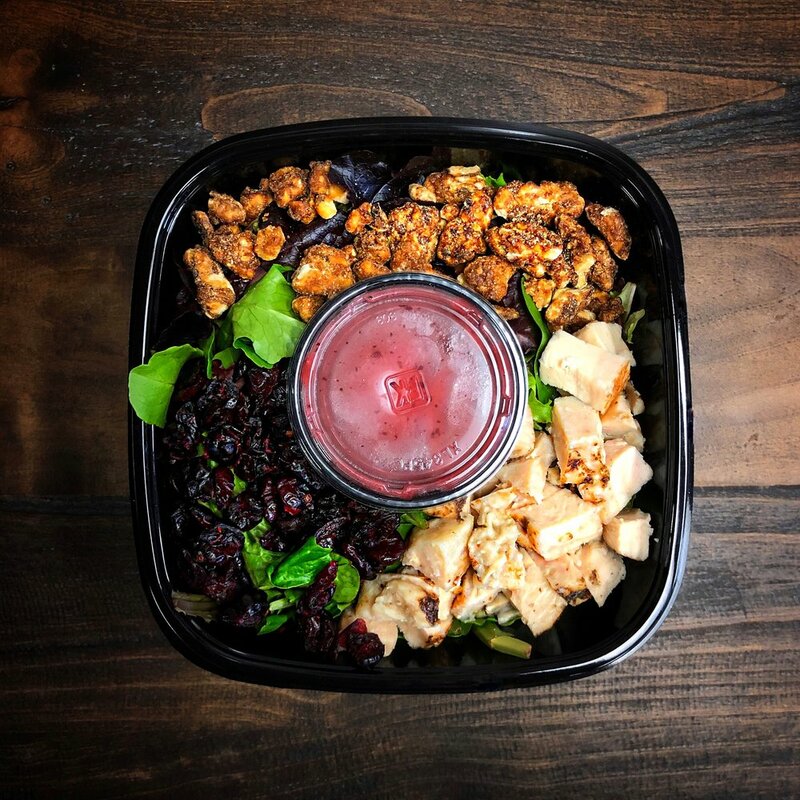 Seasonal mixed greens, dried sweet cranberries, natural glazed walnuts & grilled chicken. Served with a raspberry-walnut vinaigrette on the side. *Substitute avocado for chicken as a vegetarian option. Seasonal mixed greens, dried cranberries, blue cheese, natural glazed walnuts & grilled chicken. Served with a raspberry-walnut vinaigrette on the side. Seasonal mixed greens, red cabbage, matchstick carrots, tomato, green onion & cucumber topped with a large scoop of our tuna salad. Served with a balsamic vinaigrette dressing on the side. 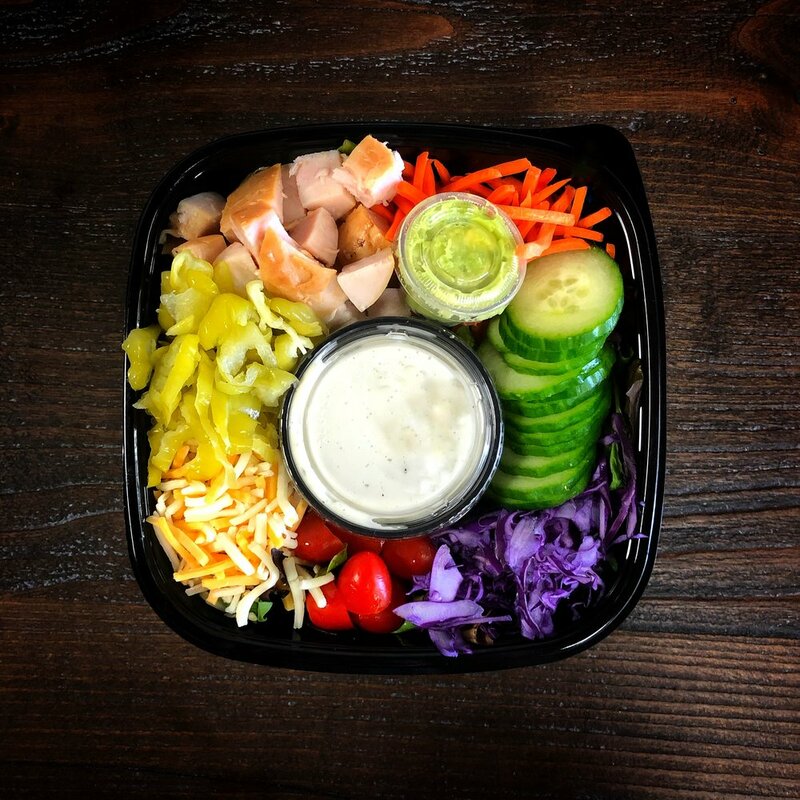 Chopped romaine lettuce, red cabbage, matchstick carrots, cucumbers, green onions and grilled chicken. Served with a Thai Peanut dressing on the side. Chopped romaine lettuce, red cabbage, carrots, tomato, cucumbers, green onion, cheddar cheese, smoked turkey & avocado. Served with a farmhouse ranch dressing on the side. Chopped romaine lettuce, aged parmesan cheese, seasoned croutons & grilled chicken. Served with a premier caesar dressing. ⚠️ ALERGY ALERT: Kettle chips cooked in a peanut oil blend. 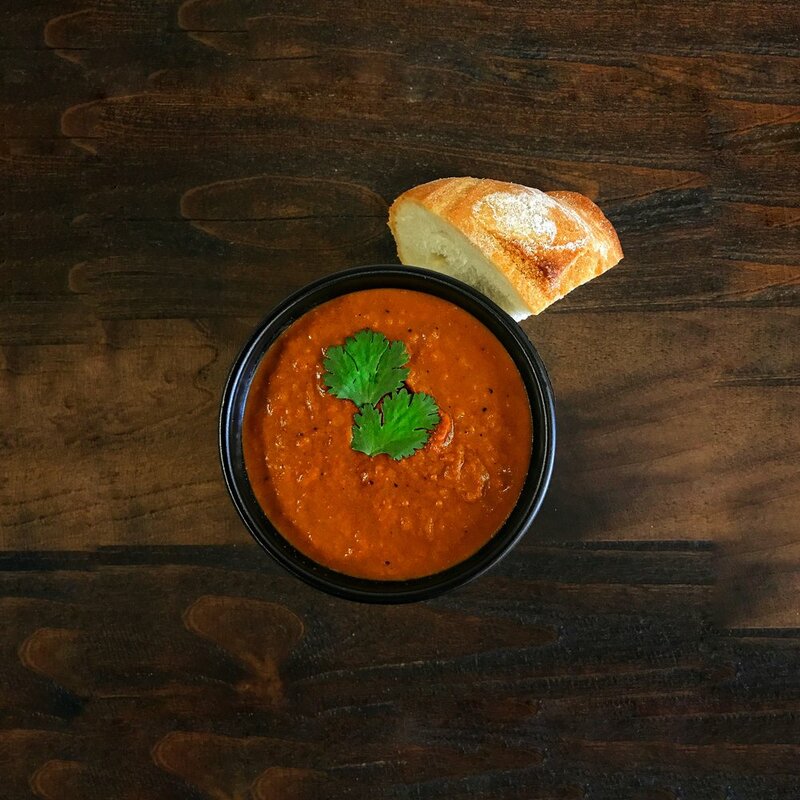 To see todays featured soups click the VIEW TODAY'S SOUPS button above. Nutritional information is currently being updated and will appear below when it becomes available. *Prices exclude tax where applicable.